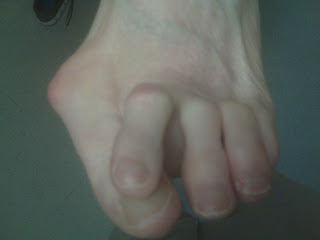 ﻿ Patient Carleen presented to my office yesterday with a swollen big toe joint. These first two photos show how swollen the area looked. 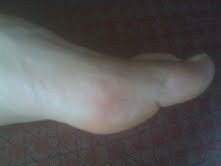 Compare the swollen right big toe joint with the uninvolved left big toe joint seen in the third photo. After getting the MRI imaging, I drained the cyst of 5 ml of bloody fluid and sent it to the lab. The lab did not identify any bacteria. Hooray!! Carleen was started on icing and contrast bathing to reduce the swelling (minimum of 3 daily of the combination). She was given a hapad arch support to transfer weight into the arch and dancer's pad to float the painful toe. See the padding used in the following post link. I will follow her in two weeks. Ganglions may resorb, but some have to be surgically removed. I would inject 3 plus times with cortisone before considering surgery. She will need some form of orthotic device designed for her shoes to prevent pressure. The biomechanics of her foot is of a plantarflexed first ray which sticks out like a sore thumb and gets easily bruised. This bruising over time can lead to the gradual development of a cyst. Carleen first felt symptoms 3 months ago, but does not recall bruising her foot. It is probably her biomechanics coupled with unpadded shoes, or the normal stress of activity, that causes the tissue to be initially traumatized. Ganglions are normally produced by normal joint or tendon fluid, that due to a weak spot in the lining of the joint or tendon sheath, allows the fluid to begin to seep out of the joint/tendon and into the surrounding tissue. The body attempts to wall off the fluid, but the hernia formed causes a gradual cyst formation. The biggest cyst of this type is called a Baker's Cyst off the back of the knee joint. Hopefully, with Carleen, we will be able to prevent surgery. Several videos on this subject. Since I am on the Infectitious Disease Committee at Saint Francis Memorial Hospital I would be remiss at not publishing this important message. I sent you an email last week but hadn't heard back so I wanted to try you again. As you may be aware, the Department of Health & Human Services recently released its annual report on the quality of health care Americans receive. While there have been some improvements, hospitals still have work to do to put an end to the ongoing - but solvable - problem of Healthcare-Associated Infections (HAIs). Caregivers and other healthcare professionals know steps need to be taken to protect patients from HAIs, but it will take strong leadership to make the changes necessary to reduce the likelihood of these life-threatening infections. To help achieve this goal, Kimberly-Clark Health Care launched "Not on My Watch" (www.haiwatch.com), a website that provides tools and information to help facilities eliminate HAIs. Please let me know if you have any questions or need more information. If you are able to post about this, I'd love to get the link to your post. 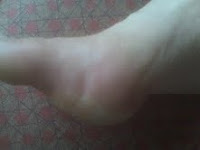 Question, currently I suffer from hammertoes on one foot, it is the second toe next to Big toe. It is completely dislocated, now on my right foot for the last year I'm having a lot of pain and my foot is swollen and the second toe is starting to turn under some. My biggest issue right is I have this sore foot and shin splints, I can't walk very far anymore because of it, I can't shop for long or do any standing in one place very long. Do you have any suggestions? Dear Gloria, I am imaging that you have a hammertoe that looks like my patient Paula below. Here her toe is dislocated with the big toe now moving under the second toe. As the 2nd toe goes up, the 2nd metatarsal is pushed down against the ground much more than normal allowing for stress to build up in the tissues. The soft tissues under the second metatarsal/toe joint begin to scream bloody murder and pain starts. This pain causes swelling which causes more pain, and a vicious cycle is created. 4. Avoiding bending the toe joints as much as humanly possible (ie. stay flat footed on the ellyptical machine). 5. 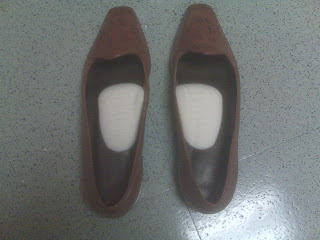 Begin using Hapad Small Longitudinal Medial Arch self adhesive pads in most shoes. When you are in alot of pain, I would probably try to rest the foot in a removable boot and try to get an MRI to find out what is going on. If finances are an issue, the removable boots can be purchased online and try to wear for 6 to 8 weeks while you ice three times daily. I sure this helps you. The posterior tibial tendon is one of the main supporters of the arch. 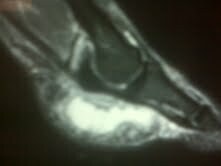 For many unfortunate patients, the tendon tears leading to significant arch collapse. I will have many posts on this very disabling injury. I am very happy to use the Inverted Orthotic Technique (aka Blake Inverted Orthotic) for this injury. The pronation is so severe that a corrective orthotic device is necessary, and sometimes medial shoe wedging and/or ankle bracing. Many of these patients do need surgery, but some can avoid surgery with the Inverted Technique. This is a brief introduction. Let's start by watching this great video on a posterior tibial dysfunction patient on both sides. So how can this patient be helped. Let us focus on the right foot. 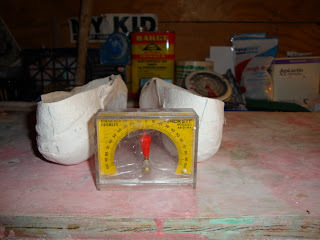 I measure the heel position from vertical (heel straight) with a goniometer. Here the ruler is only being used to show how much this 10 everted (valgus) is off from that vertical heel position. 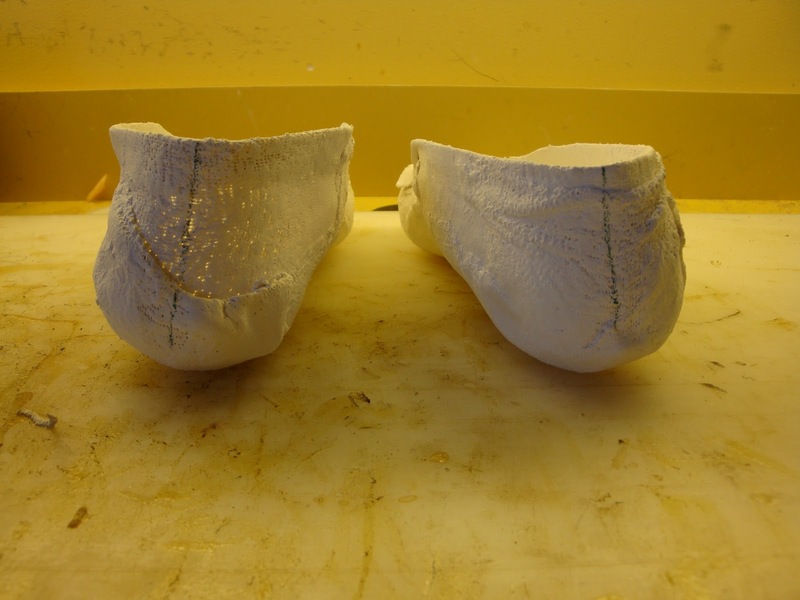 Impression Casts are taken of the feet. In this case, the casts show the valgus heel and can be measured. The goal is to correct the heels back to vertical. From the measurment of heel valgus standing, the Inverted Technique uses a 5 to 1 ratio to set the cast in an overcorrected position with the goal to straighten the heel back to vertical. If the heel is measuring 5 degrees of valgus, the positive cast would be set at 25 degrees inverted. I never go above 35 degrees initially due to the radical change that the patient will need to make. I will talk later about how you increase the correction based on the patient's response. In the positive cast above set at 35 degrees of inversion see the amount of space under the medial heel area. It is this part of the cast which will attempt to control the pronation by placing supination forces into the medial heel and midfoot. In the above example, a 35 degree inverted orthotic device was initially used to correct a 10 degree valgus position. The correction was true to the 5 to 1 rule. The 10 degree valgus position was changed to a better 3 degree valgus heel. If necessary, further simple mold adjustments will be used with Kirby Skive and Medial Column Correction to obtain the remaining 3 degrees. I hope this is a good introduction. How much of a short leg is enough to cause injury? Here is the standing evaluation of the pelvic landmark for measuring for a short leg. The examiner should remember to keep the hands parallel to each other and the ground. The examiner's eyes should be at the level of the hands. When treating leg length discrepancies in athletes, as little as 1/16 inch can cause a definite overuse of one side of the body. I highly recommend correcting for any leg length difference in a highly competitive athlete, and definitely in chronically injuried patients. It is a relatively easy treatment to observe the effects on a treatment. You may be surprised at such small differences, if corrected, can make such a large difference in symptoms. Definitely pull out the lifts if you notice no change or a worsening of symptoms. The American Podiatric Medical Association sponsored this video on Diabetes. Very important for diabetics to always stay diligent about their foot care. Check their feet daily. See their podiatrist regularly. Take every sore or pain seriously. Monitor their blood sugars. Know your HbA1c. If you are having heel pain and wear custom made orthotic devices, consider having 1/8" to 1/4" gel sheets applied. You can get them at Alimed. See the link below. For walking the 1/4 inch is great, but for sports 1/8 inch is normally perfect. First of all here is two comments from my patients. They just never wore the ones you make! Signed Shirley to me!! Orthotics are the greatest invention since corn flakes! I may very well be one of the first people to wear them, having obtained a set in 1959 (they were made from plaster casts of my foot of 100% cork in those days and suggested by my Podiatrist Dr. John Pagliano, of Los Angeles. His son, Dr. John W. Pagliano, DPM, is a famous sports medicine Podiatrist in the greater Los Angeles area). My current pair are state-of-the-art orthotics made by Dr. Rich Blake, DPM of St Francis Memorial Hospital (Catholic Healthcare West) in San Francisco. They have cork heels. They aid in preventing of my previous lower back problems and sore arches. I want to thank Shirley and Richard for bringing the New York Times Article to my attention. I have been practicing for 30 years, average making 200 pairs of orthotics per year, giving me 6000 pairs of orthotic experience to bring to this table. And I am Past President of the American Academy of Podiatric Sports Medicine, and Past Editor for Sports Medicine of the Journal of the American Podiatric Medical Association. Orthotic devices are shoe inserts prescribed for a specific function, normally to relieve pain. And the orthotic devices must make the patient walk or run more stable, more fluid, with less stress at heel impact, produce better alignment at pushoff, be comfortable, and so on. These are heavy demands placed on the prescribing doctor/therapist/orthotist, but the sophisication is there to accomplish these goals. The advances in the orthotic industry have been so immense in my 30 years in practice that I find poor orthotics only made by those disinterested in the process. The patients demand success. And success is normally delievered by the health care system. I am very proud of my podiatric colleagues for their work in this regard. There are podiatrists, like myself, that specialize in orthotic devices. But, great orthotic devices are being made all over. Much of Dr Nigg's comments (and I respect him immensely) show he does not dwell in the world of foot pain. My last patient of the day Toni will never ever take Dr Nigg's comments (and I hope he was just misquoted). Toni had severe foot pain, 4 years ago orthotic devices eliminated that pain, and you can not convince her to not wear her orthotics. And I do not blame her!! In my practice, I make routinely probably 20 different types of orthotic devices. And I take very seriously my need to get it right since many insurance companies will only pay for one pair a year. I do not have the freedom of a researcher to experiment away with every patient. So I try to analyze what type of orthotic device is appropriate for this patient with these symptoms at this time. It does not mean that this patient could have 10 reasonably different pairs made for them, each doing something alittle differently, each affecting different change at their feet, ankles, knees, and hips. But that would be so confusing to the body. I am glad I do not have to research these changes from subjective data from the patient. Orthotics Work Wonders!! I believe that because I have see that every day in my practice. Many patients can not consider walking a step without them due to nerve damage in their foot that no strength gain in their foot could ever compensate for. Who is Dr Nigg to send negative energy into this realm? Medicine is all about healing, about hope, about positive energy. Orthotics, even in the most challenging patient, with the most difficult symptoms, are a symbol of that hope. I know enough about the world of orthotic devices to know that if they fail to help a patient it is because I am not understanding the situation enough. It has nothing to do with orthotics, it is the imperfect humans prescribing them. I ask Dr Nigg to do research on how long it will take a patient with nerve damage to strength their feet so they can avoid orthotics all together? Why do patients get orthotics? They are in pain, and their mechanics seem to indicate that some change produced by an orthotic device would be helpful. So they get orthotics. The pain goes away. Some good research should be done on how long should the patient remain in orthotic devices after it cures their problem. The average patient does not want that pain back. They may be very happy to wear orthotics forever, like I wear my eye glasses. Yes, I should do some eye exercises, but I am taking the easy way out. Yes, I need to have all my orthotic patients doing 2 to 5 minutes every evening foot strengthening exercises. So, they won't be so frail. So, I applaud the New York Times for bringing this to the forefront. Being from San Francisco, where William Randolph Hearst made yellow journalism famous, I understand how you want to sell papers. But, why don't you give hope, because orthotic devices have stood the test of time in medicine, and deserve praise for how well they have helped millions over the last 40 years since modern day orthotics were introduced to the world by Drs Root, Weed, Sgarlato, and Orien. Boy, have they changed the world. I, and my patients, salute you gentlemen. Taken from Root Lab brochure. Dr Mert Root, my teacher, my mentor, my friend. I miss you. Passed away after a long illness in 2002. I hopefully will be able to introduce you to Root Balancing. I owe it to Dr Root, an unbelievable giver, and healer. His son Jeff, and daughter in law Kathy, run his lab still, even though Dr Root passed away in 2002. A terrible loss. These are forefoot valgus impression casts. When you stand them up, they lean to the outside. 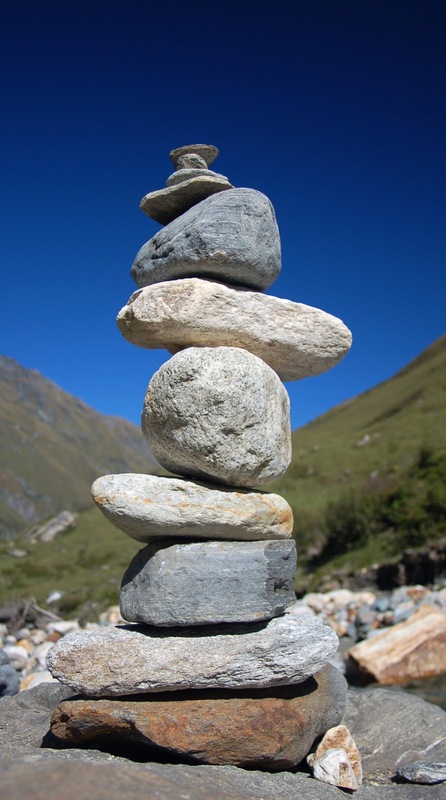 A Root Balanced Orthotic Device will attempt to stand them straight up (heel vertical). This is simply an introduction to a hot topic in podiatry. As more and more labs go computerized, and the health care provider has less and less control of the final product, the consumer may have to be more demanding. I have made a good living converting modified Root Balanced Orthotic Devices to classic Root Balanced Orthotic Devices to achieve better stability and better symptom relief. Talk to your podiatrist whether they use classic Root or modified Root techniques. Root technique is like the paint brush however, the individual provider must have the freedom to paint. Philosophy: Is your health care provider really seeing the whole picture? I love this image of a health care provider looking into a patient's problems. I can work with patients for a long time and realize I am only seeing such a small part of who they are and what ails them. Health care providers learn to look through the stuff that separates, but only as a patient opens up. I am afraid modern day medicine is retreating behind a thick wall to some degree. The beautiful art of medicine lies in the decoding process of all the pieces we are given. I have been recently treating a patient named Stephanie. Because of how serious her injury, I am really getting to know her. She has a nerve injury we are trying to sort out. She is getting many opinions on my recommendations. We talk, we email, we explore. I am so impressed at her strength, but understand her fear. Most health care providers want to see their patients face to face for every exchange, but it is not practical. The fragmented images are more fragmented on paper, or phone, or internet, but it is just a new learning curve. I have learned to love the ease of the email. But, since I am from San Francisco, I miss the hugs (probably why I got into medicine in the first place). Today I had a great visit with a patient named Robin. Very complex spirit, but very centered, and easy to be with. I am sure I am seeing her through a peep hole, or a crack in the fence. If her health requires alot of investigation, I feel she will be fun to work with. The world is crying out for health care providers to be primary care doctors (where the buck stops!!) Not triage doctors which hear a complaint, and always just swish you around to various specialists. Every specialty should have super specialists and general care specialists. I feel I do a decent job as the primary care podiatrist for my patient's foot and ankle problems. By being the foot primary care specialist, the buck stops with me!! Even though I am sending Stephanie to various specialists, I gladly take full responsibility to help her decide her options, to wade through the complexities. If you have a foot injury, you should have a primary care foot specialist who takes care of you--and that can be a physical therapist, podiatrist, orthopedist, chiropractor, etc. Someone who is committed to know what every one is saying, and to see you through the injury to the end. Someone who will be priveleged to see you at a deeper level. It was fun, but definitely a blur. a busy person, especially during this part of the year. for my consultation with the HMO podiatrist. She definitely said that it wasn't a bunion, but after viewing the images said it was a bone spur. a good option. If it would at all alleviate some of the pain I've been having when pressure is put on that area. Also, if there is a chance that it would give me back a little more motion. She said it would be probably around a two-week rehab with the smoothing out process. Right now, my foot definitely lets me know when I've worked it too hard or am in the wrong kind of shoe. All my shoes are pretty much flats, (supportive flats) but it still bothers me with all the dancing I do. The orthotics were declined by the HMO, so I won't be getting those anytime soon. or make a follow-up appointment to see you in person at St. Francis. Dear Heidi, Thank you for allowing me to answer this email on my blog. I have even changed your name to protect you. When you first saw me the podiatrist had been talking about fusing your big toe joint as a primary surgery and I was quite appalled. I am so glad that opinion has changed. You definitely need surgery, but good rehabilitation of the toe joint will take a few months, and you will have to be good to the toe for about one year. Why do you need surgery? Let us look at your xrays. Here are the straight images from the top of your foot noting arthritic spurs and irregularities in the joint suggesting Hallux Rigidus with degenerative arthritis. 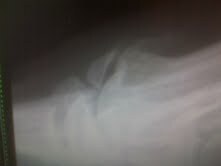 You can see part of the joint does not look healthy at all. Here is the 2 links in which I discuss Hallux Rigidus that I know you have already seen. The 2nd one where you will be following surgery, and the same treatment will be needed (immobilization to some degree with anti-inflammatory, following by a restrengthening phase to return you to activity). Every one goes at a different pace. 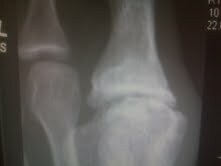 This is just a zoomed out version of the above photo giving you more perspective on the arthritis in the big toe joint (irregularities) not seen in the 2nd joint next to it. 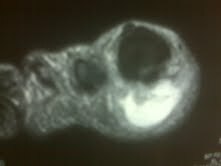 This view however shows nothing that guarantees you need surgery (we see it in the side view called the lateral view). It is this side (lateral view) of the big toe joint (first metatarsal-phalangeal joint) that shows why you should have surgery. 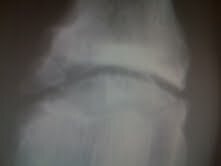 See the large piece of bone wedged in the top of the joint. It is an arthritic spur that may have broken off at some time, but definitely you can not co-exist with this for your life. Surgery (called a cheilectomy pronouced ki lec toe me) would clean out this and all the other spurs and irregularities and give you an arthritic but less painful joint. The surgery just sets the stage for the rehab. The rehab of your toe and physical fitness can not begin until this is cleaned out, and the doctor you mentioned has a good reputation. But, this is not To Cut Is To Cure, the surgery is 50% and the rehab is 50%. I would feel comfortable with you having surgery, if I felt comfortable that you will get all the right physical therapy, orthotics, taping, castings, etc that you need after. That should be your next big discussion with the surgeon. Without good rehab, you will get even less motion in the joint afterwards. I had a great discussion today with a patient Valerie. She appeared from the onset to have Hallux Limitus (limited range of motion of the big toe joint) as her primary source of pain, but as we discussed her situation and the onset of pain it seemed like her symptoms correlated more with nerve irritation. The nerve that runs on the top of the instep can get irritated from shoe laces and eyelets real easily. 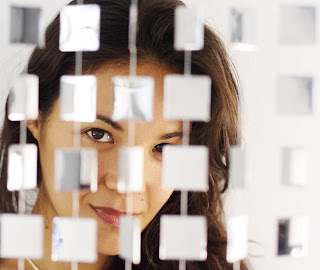 So again her and I as a team will try to Put The Pieces of the puzzle Together. Today was her initial visit, so we had the first rock today. Not sure how high it will go. We started by icing the big toe joint 3 times daily with a 10 minute ice pack and avoiding activities that bend the toe too much (lunges with her trainer, and high heels). But we also started with lace skipping to remove pressure on the eyelets that are the most painful, tongue padding with felt to spread out the pressure over a larger area, and gentle nerve stretching with ankle range of motion movement. I told Valerie to email me in 2 weeks to see how she is doing, and we can add another rock if needed. I have a question that would probably be a great one for your blog. I joined a competitive beach ultimate league and will be going to a beach tournament in two weeks. I haven't played a lot on sand, so I'm trying to figure out what equipment I need. First of all, do I need to wear the braces on sand? It seems harder to get injured by the surface, but there's still a risk of stepping on another person, which is how I got the high ankle sprain in the first place. I also sometimes get the sensation that something is 'giving' in my ankle in certain positions (just moving around the house, not in athletics) when unbraced, and I wonder if sand allow it too much freedom. Editor's Note from Dr Blake: Sasha had a really bad sprain, actually a high ankle sprain which she is getting better from, but I would protect it in unstable environments like this for a year longer than you think you need to. And during that whole year do ankle strengthening emphasizing fast twitch and proprioceptive strength. Second, if I have to wear the braces, can I wear sand socks as well? Over or under the brace? Editor's Note: It would be preferrable to wear the Sand Socks against your skin and the ankle brace on the outside. I do know a few patients that wear an extra Sand Sock on the outside to protect the brace from the sand. You would have to get 1 or 2 sizes larger for the outside layer of sock (ie medium inside and large or extra-large on the outside). You asked me to report back about my HMO. It was very difficult to get that initial appointment, since they wanted me to go through a general practitioner first (with a 3-week wait for an appointment) and then make an appointment with a physical therapist (another 3-week wait). I did some complaining and luckily got through to the Sports Medicine department, which is entirely separate from the Physical Therapy department. I left a frustrated voicemail for the department supervisor and she called me back offering me an appointment the next week! So I learned early that it pays to be an advocate when you are not the default case the System is expecting. Since I was at the end of my rehab, I had two appointments with a physical therapist (who is herself an elite ultimate player!) to show me more aggressive and sustainable strengthening. And I've been OK since. Wearing braces on both ankles when I play sports, but not when I run or bike or walk. And free of other sprains and pains in that ankle! Editor's Note: Hooray!! Most patients following an ankle sprain just play lip service to the restrengthening phase from 3 to 12 months post sprain. It is not hard, but takes an effort and discipline, since you are normally feeling great at that level. Sounds like the physical therapist did great by her. Thanks again for the great care when I had my last insurance. I've recommended you to several acquaintances. And thanks for considering my questions! I am so happy to find my colleague and former head our Dance Medicine division at the Center For Sports Medicine Elizabeth Larkam. I am presenting Elizabeth's series on foot exercises. These are extremely helpful, but watch for pain or cramping in some of the metatarsal doming (Elizabeth is very skilled). Go easy when you start doing this series. Try to do them 1 or 2 times per week. This set of exercises is for range of motion and some strength. Elizabeth does them so easy, so don't be frustrated. I have the attached my most recent post on foot exercises which this can couple with. I like her comment on doing 2 per day of the variety of exercises. Your feet will slowly get more flexible and strong. And do not forget your yogatoes or their equivalent. Happy New Year from Dr Rich Blake!! Podiatrists, and many physical therapists, make orthotic devices and other biomechanical decisions based on balancing the patient's forefoot abnormalities. When the primary function of the orthotic device is to support structural problems in the foot, the orthotic devices is called a balanced orthotic device or Root balanced orthotic device. Dr Mert Root, the founder of modern day orthotic devices, first published and lectured extensively on this subject in the 1960s and 1970s. It is still to many health care providers the only way to treat patients. The next few weeks I will be discussing the biomechanical guidelines surrounding this type of approach. It was the 1980s that the next explosion in biomechanics occurred with the development of Corrective orthotic devices with Biaxial sectioning, Inverted technique (my invention), Kirby Skive, and other modifications. Here the foot was modified to correct the forces of pronation more than could be accomplished by Root balancing or modified Root balancing. Here will be many posts on these sections. This is the typical appearence of the outside or lateral arch in a Root Balanced orthotic device. The foot is suspended off the ground along the lateral side of the foot. This is crucial in supporting feet with many injuries including metatarsal fractures, neuromas, ankle sprains with instablility, etc. Now see the mold below. The lateral arch is filled in. This is more like an OTC orthotic device now and loses its effectiveness for many injuries. Below is the orthotic device designed around Root Balancing. See the great lateral and medial archs. With this type of orthotic device, there are times when you can not tell which is the inside arch and which is the outside arch. Root balancing is classic podiatry and since it can be more harder to get used to, it is commonly lowered labs whom want to make a comfort orthotic device. Unfortunately, the effectiveness of the orthotic device may be greatly sacrificed. This the the common look of an orthotic device for a forefoot abnormality called forefoot valgus or plantarflexed first ray.